On a cold morning, familiar faces were peering through the clothing racks in City Sports anticipating the weekly breakfast run. It was 10:25 and only a hand full of us were quietly anticipating the run. 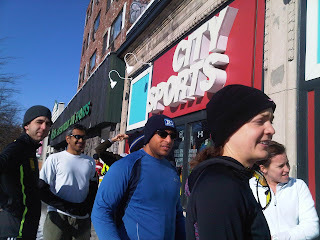 Jared, from Run Boston asked if this was a typical number of runners (8). New to TMIRCE, I explained that within the next 10 minutes, 30-50 people would reliably show up; and you did with gusto. With an informal bang of the gong, a throng of 40ish people took off down Comm. Ave. with the intension of finishing quickly to get out of the 20 degree weather. I was lucky enough to get to run with Chris Wagner, perennial all-star and general nice guy of TMIRCE. We mused on the pros and cons of Vibram Five Finger running as well as our respective marathon training schedules. Returning to CS, the breakfast table, that had been sparse pre-run, had ballooned to include all the favorites we’ve come to love – bananas, muffins, juices, and other fruits, and my favorite of the week, a homemade nut and granola combo (went well with yogurt). Kristi, Pablo and the CS team were all on hand helping informal runners try on their favorite shoes and to chat about the impending snow storm of the week. On a special note, our favorite Brooks rep, Trish Steele ran with us and showed off her new Brooks HVAC running gloves; the same type I wear only less tattered – my jealousy, unrivaled, has been contained for the moment. Special Guest: Our founder, Dave “to tall” Johnson will attempt to run the ice rink of the Charles River. Soles4Souls: We’re still collecting your old running shoes for our special annual donation. PS: I’ve been collecting receipts from Star Market purchases to try and levereage our Saturday buying power to negotiate for parking spots in their nearby lot.